Today’s guest blogger is collector Dave Short. He and his son, Jonas, have a website called Picking and Collecting. The duo is also active on Show & Tell. Immediately following World War I, the German economy was in shambles as it struggled to pay heavy war reparations. The German people suffered greatly under a shortage of consumer goods and hyperinflation. Even the once proud Luftschiffbau-Zeppelin Corporation had to fight for its existence. The few remaining zeppelins in its fleet were given to the Allies, and there was a push to have the company dismantled because of its part in the war. 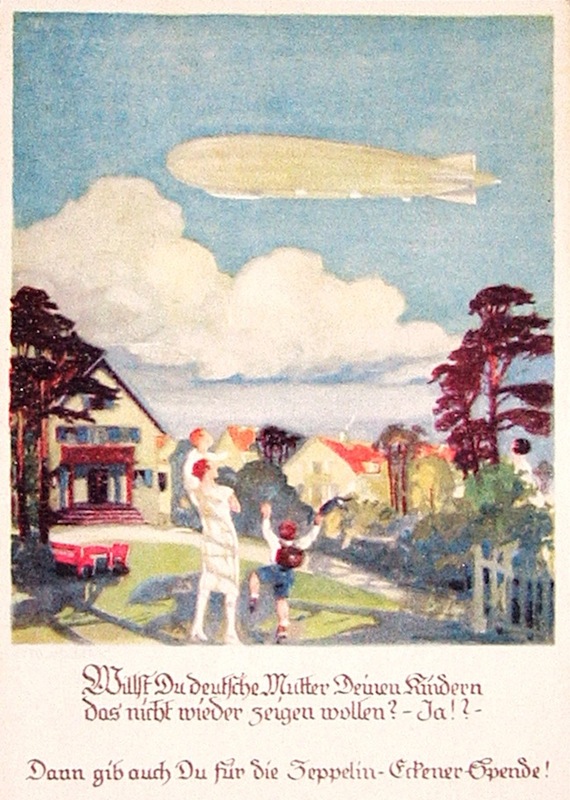 Since German companies were forbidden from building aircraft, Luftschiffbau-Zeppelin turned its aluminum-manufacturing expertise from airships to pots and pans. In 1922, the ban against commerce with Germany was lifted so that Luftschiffbau-Zeppelin could build the LZ-126 for the U.S. Navy—it was renamed the ZR-3 USS Los Angeles. After the successful delivery of this airship, Dr. Hugo Eckener, head of Luftschiffbau-Zeppelin, began to push the idea of building a large passenger zeppelin. At the time, much of the leadership of Luftschiffbau-Zeppelin felt the era of the German airship was over. In fact, many of the company’s best airship engineers were already on their way to the U.S. to join the newly formed Goodyear-Zeppelin Corporation. If Dr. Eckener wanted to build another airship, he would have to find a new source of funding. In August of 1925, coinciding with the 25th anniversary of the first zeppelin, the Zeppelin-Eckener-Fund was launched. Every man, woman, and child in Germany was asked to contribute. In addition to the sale of fund-raising postcards like the one show above (translated, the card reads, “Would you, German Mother, want that your children should never again see this sight?”), stamps, coins, and other trinkets were sold. The fund eventually raised $2.5 million. In view of this positive public sentiment, the German government contributed an additional $1 million, while Luftschiffbau-Zeppelin officers, who had been hesitant to support the program, allocated the remainder of the $7 million needed. The resulting LZ-127 Graf Zeppelin became one of the most successful airships ever built. The Graf Zeppelin provided transcontinental passenger service for almost nine years, in addition to an around-the-world tour in 1929 and a polar expedition in 1931. I am under the impression that the Zeppelin works would have been dismantled by the provisions of the Treaty of Versailles if Ekener had not bribed with hard cash the Noble Committee Members to spread the word that war machines could be used for peaceful scientific reaserch. They did as theyt were requested with the results being high altitude strategic bombers like the LZ129 or the Hindenburg posing as civilian transports. What do you think of this idea? I can’t remem ber where I read it. Drop me a line if you will. “ ” If you're scared by something that's not really that scary, it has more of an impact on you.